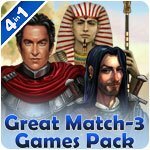 Great Match-3 Games Pack Game - Download and Play Free Version! The Greatest match-3 bundle ever assembled! Search for legendary Egyptian artifacts amid the unforgettable atmosphere of Ancient Egypt. Strategize the construction of a great city and become its ruler! With a host of dedicated assistants, you'll be able to focus only on puzzle-solving. Customize the city with a range of design choices and decoration, and build the perfect avatar using the face generator and clothes shop. 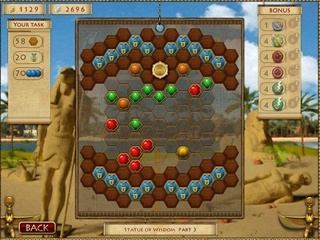 An unforgettable Egyptian journey is in store, as you rise to power as Queen or Pharoah. Escape from a deserted island in this fun and exciting Hidden Object game! 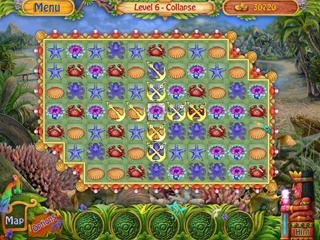 Survive in the dangerous jungle and make it home in Robin's Island Adventure. Complete a series of Match 3 and Hidden Object levels as you build shelter, find food, and work with the inhabitants of the island. Can you build a boat sturdy enough for you to make it back to civilization?